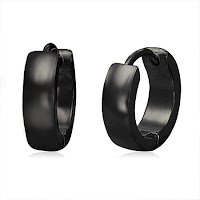 Just arrived these fashionable & popular design hinged Hoop earrings designed for men are made from high grade 316 stainless steel & feature our popular black finish. Black finished jewellery is becoming very popular for men due to it matching great with the urban distressed finish of clothing brands that have become a strong presence on the high street in the past couple of years. These hoops are ideal for men as they have a hinged fitting to them which makes it easier to fit into your ear but also much more secure. Great value at only £9.99 a pair with FREE worldwide delivery!